Expect to see more electric cars this June – not necessarily on the roadways, but in the state’s update to the Energy Master Plan. That’s because when it comes to reducing greenhouse gases, New Jersey is turning its focus from electricity generation to the transportation sector. Electric vehicles are a big part of the state’s plans for reducing greenhouse gas emissions. Transportation represents 42 to 46 percent of all of New Jersey’s greenhouse gases, he said, so it makes sense for the state to target transportation. And reducing greenhouse gases is not some abstract idea: New Jersey is obligated to reduce the amount of greenhouse gases it generates to 80 percent of its 2006 level by 2050. “On the trajectory we are on now, we are not going to make it,” Baldauf said. The Energy Master Plan (EMP), led by the Board of Public Utilities in consultation with DEP, is a complete look at where New Jersey gets its energy from, how it uses it, and what needs to change in the future. A big part of that is going to be what Baldauf refers to as the electrification of the transportation sector. At the same time, DEP is conducting its own inventory of New Jersey’s greenhouse gases and working on a report on how it plans to meet the 2050 goal. Those efforts will dovetail with the EMP, Baldauf said. New Jersey will also start releasing some of the money it received from Volkswagen as part of a legal settlement over the company’s emissions scandal. Baldauf expects a portion of those funds to be dedicated to electrification projects. All of which adds up to transportation policy being the key to greenhouse gas reduction in the future. “We need to make a big dent (in transportation-related emissions) if we’re going to have any chance to meet the 2050 goals,” Baldauf said. 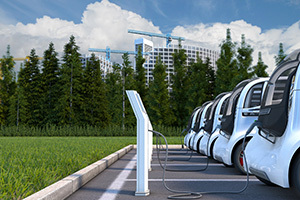 Cities need to be on board and allow charging stations at ALL business locations. That will allow more people to buy electric cars without the fear of running out of energy. Businesses who allow strangers to charge (with a fee to pay for the electric) will allow for cars to be charged even if a free station is not available. My office will allow free charging as a perk to employees and would like to offer it to others if they cover the cost. I hope my municipality will allow that! There is no intent for profit, just a service without having a penalty for doing it. To start making a significant dent in our transportation emissions we also need to look at where the largest immediate impact can be made. That would need to include heavy trucks and buses. Why are we also not promoting and using Renewable Compressed Natural Gas in our current state CNG vehicles and buses which would have a significant impact with no additional potential cost. Local firm renewable energy sources such as Bio Gas to Electricity and Bio CNG (RCNG) need to be at the forefront of the solution, and as it happens are currently in abundant supply in our state.